Miller chose a different path, and millions of fans worldwide will never hold that against him. Nearly 70 years after he first strapped on skis, the godfather of ski films has lost no momentum. He heads an entrepreneurship foundation, has finished a new book on aging and remains perennially obsessed with the concept of freedom. Wild Blue Yonder: Do you still encourage today’s generations to quit their city jobs and head for the hills? 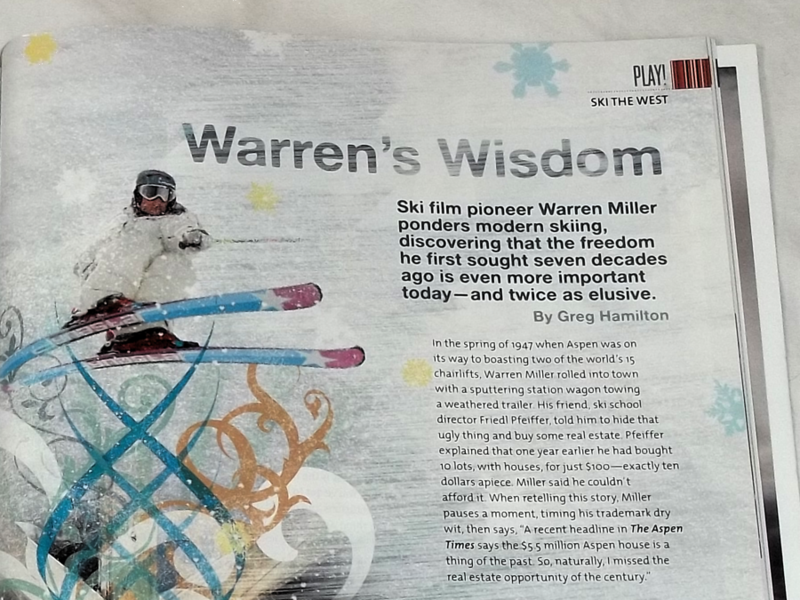 Warren Miller: I recently wrote a draft of a commencement speech where I would have said, “First, give your father back the keys to his car. Then give back your mother’s credit card. Then go out and get a job.” Then I was to walk off the stage. Funny, I never got a call back on that one. WM: You only get out of life whatever it is you go after. It’s the same with skiing. Jean-Claude Killy once told me that a mountain is like a beautiful woman. You can go to her as often as you want and she will only give you what she wants. WBY: What is it you wanted from that mountain? WM: Freedom—that’s what skiing is all about. Ask people about their first day of skiing and they remember the weather, what they had for lunch, what kind of car they rode in. Anything that memorable is the first taste of total freedom. Total freedom is man’s basic instinct. WBY: At 83 you’re still going back to that mountain? WM: Yes, but I’ve slowed down. If Steve Stunning thinks he’s as good a skier at 50 as he was at 25, then he must have been pretty crummy at 25. It’s all relative. I used to feel the wind in my hair. And then I didn’t have any hair, and now I have a helmet and can’t feel the wind anyway. So what difference does it make? The only thing that matters is the size of your smile. WBY: Is skiing a Fountain of Youth? WM: Researching and writing my book on aging has been a big help. As you get older, you’ll realize stress is the number one killer of people. You’ve got to lower your physical expectations and get rid of a lot of stress. The thing with skiing is you can’t think negative thoughts while you’re making turns on snow. Every time you get to the bottom of a hill, you experience what I call—and you probably can’t print this—a wonderful psychological enema. WBY: Ever ski with those competitive types who count runs and have to beat you to the bottom? WM: I’ll never go in front of them because they spend the whole run trying to pass me. It’s like golf; I never keep score. Life is so competitive, why bring that to your day off? Unfortunately, keeping score is what the world’s about for many people, but we can change that. When I was raising money to build a skate park near my home in Washington, I made the pitch really simple: In any Little League baseball game, nine children always lose. In the skate park, no one loses. I don’t keep score in skiing, either. WBY: How do you build a 59-year tradition of ski movies without one-upmanship? WM: You have to tell the story of what you’re filming. I think that was the reason we were as successful as we were. Instead of showing Nearly Normal Norman going off this Nearly Vertical Cliff, tell me about Norman—where he’s from, how he got there—and then I can relate. All these years, I think that’s all I’ve really done. WBY: So it’s not ultimately just about freedom, but also what you do with your freedom? It’s about the stories we make once we’re free? WM: I have a poster on my wall that’s a picture from the bow of a sailboat. It says, “When all that holds you is the horizon, that’s real freedom.” Most people are afraid to look over the horizon, but that’s where freedom begins.